PSA Singapore, a fully-owned subsidiary of PSA International which operates the largest container transhipment hub in Singapore, is currently showcasing advanced port technologies at its “Intelligent Port of the Future” Exhibition held from 10-14 January 2018 at Pasir Panjang Terminal Building 3. Divided into three zones, the exhibition begins with a look back at PSA’s early years in adopting technology, and takes visitors through the transformation of jobs and operations by means of technology and innovation. The exhibition will feature technologies never before seen at container terminals in Singapore, including amphibious drones, automated quay cranes, exo-skeletons for port staff, and robotic arms for related container activities. It will also provide the up-to-date information on the future Tuas mega port, which is being developed nowadays in Singapore with operations starting progressively from 2021 and where current Pasir Panjang, Tanjong Pagar, Keppel and Brani container terminals will be relocated. Ong Kim Pong, Regional CEO Southeast Asia, PSA International, said that the exhibition is an opportunity to showcase PSA’s commitment to advanced technologies and innovation for port operations at both our current terminals and the future Tuas Port. “We also look forward to the opportunities to upskill our people to handle the new systems coming on stream. These are key in ensuring that we continue to serve our customers well into the future as industry consolidation grows,” he added. Among the technologies demonstrated at the exhibition visitors will find automatic platforms, or robotic arms, which would streamline twist lock handling during the container loading and discharging alongside the quay cranes. With the new technology, a single trained operator could support multiple robotic arms in case of exception or error handling. Also, PSA is considering new types of unmanned drones that fly autonomously through software controlled flight plans. They can be used to fulfil ship-shore or shore-ship deliveries, or for terminal security surveillance, providing an easier, faster and cheaper method of data collection. Drones can also be employed for port equipment inspection requiring images of a crane structural joints. The company is also thinking about the development of amphibious drones that can operate over and land on water to inspect wharf side fenders. 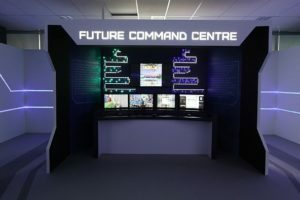 A one-stop Future Command Centre for co-ordination of automated port equipment, including Automated RMGs, Automated Guided Vehicles and Automated Quay Cranes will be presented. Besides, visitors will see powered exo-skeletons – wearable mobile machines driven by a system of motors and linkages allowing for limb movement with increased strength and endurance, thus increasing the productivity and reducing physical strain. Port specialists using exo-skeletons would be able to perform strenuous and physically-demanding motions without fatigue. PSA is also considering the application of Augmented Reality smart glasses, which would provide port equipment specialists with live visual aids and off-site assistance, thus facilitating the troubleshooting process and reducing the downtime of faulty equipment. PSA also plans to leverage data analytics in the future port in areas such as equipment specialist performance, crane maintenance and simulation models which allow the port operator to simulate container port operations. The exhibition is open to the public until 14 January 2018 from 10 am – 5 pm. Admission is free. More exhibition details can be found at the PSA Facebook page.